Shaikh Abdullaah Al-Bukhaari [may Allaah preserve him] said about Shaikh Jameel Ar-Rahmaan [rahimahullaah]: He was a scholar and a teacher; active in calling to the Book and the Sunnah; [manifested] opposition against Bidah and waged war against it; made every effort to manifest Tawheed and the Sunnah. He spoke little, kept quiet a lot and reflected much. He was a person of [good] etiquettes and lofty manners alongside a great deal of humility. He was a [person] of careful thought and consideration; a worshipper; [a man] of Zuhd and eager in spreading Sunni-Salafi learning. He established an institute called [المعهد الشرعي لإعداد الدعاة] in Peshawar. 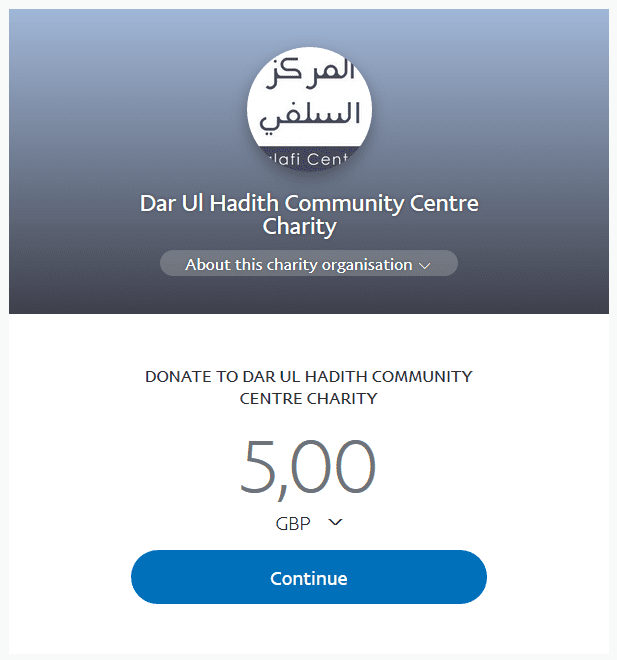 A number of callers [to Islaam] studied in this institute and its aim was to facilitate callers [to Islaam] with sound knowledge of the sharee’ah -founded upon the Qur’aan and the Sunnah. And the affair was just as he [rahimahullaah] intended. And from the efforts of the institute was the publication of Salafi Books and among those books were: [منهج و دراسات لآيات الأسماء والصفات] written by Imaam Muhammad Al-Ameen Ash-Shanqeetee [rahimahullaah]; [أصول في البدع والسنن] written by Al-Allaamah Muhammad Ahmad Al-Adawi [rahimahullaah]-a beneficial and good treatise; and also the book written by Al-Allaamah Muhammad Sultaan Al-Masoomee Al-Makki [rahimahullaah] titled: [هل المسلم ملزمٌ باتباع مذهب معين من المذاهب الأربعة], and many other books besides them. These efforts infuriated Ahlul Bidah amongst the hizbiyyeen [the illegal partisans] and those affiliated with them; so they pondered, contemplated and masterminded his killing. They embarked upon that which gives a clear indication of their malicious intentions and rage against the Sunnah and its people. They waged war against the caller to Tawheed and Sunnah-the one who erected the true flag of Jihaad [i.e. during the Soviet-Afghan war -1979-1989]. So, they besieged Sheikh Jameel and surrounded his people, and they sought the aid of the evil and aggressive people- every vandal and destructive person- for the purpose of putting an end to the banner [i.e. the call] to Tawheed and the Sunnah!! 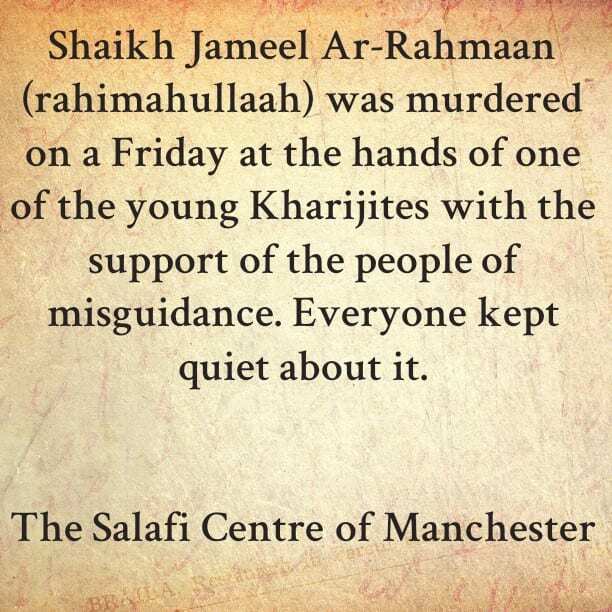 He [rahimahullaah] was murdered on a Friday at the hands of one of the young Kharijites with the support of the people of misguidance. Everyone kept quiet about it. However, Safar al-Hawali claimed that it was fitnah in which Allaah saved their hands and tongues from [involvement]! This [statement of Safar] is a statement of truth by way of which falsehood is intended, for they did not speak with truth; rather [they did] the opposite and their tongues were not saved from keeping quiet about falsehood; rather they spoke with falsehood from the angle of not speaking truth- out of forsaking [Ahlus Sunnah], hiding and defending those whom they have praised for a very long time, such as Hikmatiyaar, Sayyaaf Rabbaanee and those affiliated with them, whose defects were exposed, [and likewise] their resentment towards Tawheed and its people.